The Achilles tendon connects the calf muscle (gastrocnemius) to the heel bone (calcaneus). What is the main function of the Achilles tendon? The Achilles tendon aids with ankle movement and flexion, and allows you to point your toes, stand on tiptoes, etc. What are the main causes of Achilles tendon rupture? Achilles tendon rupture can be caused by over-strenuous physical activity, or direct trauma to the tendon (such as a blow to the back of the leg). Sudden strain on the tendon, during which the foot is forced to bend suddenly and sharply upwards (for example when landing after jumping from a height) can also cause the Achilles tendon to rupture. Bending of the ankle in this direction is called dorsiflexion. Particularly in older people, Achilles tendon rupture can be caused by a decreased blood supply to the inside of the tendon. Decreased blood supply can also cause a condition known as Achilles tendonitis. An existing condition of Achilles tendonitis can develop into a rupture of the Achilles tendon. Achilles tendonitis is an inflammation of the Achilles tendon, which causes pain and stiffness in the ankle. The pain tends to increase when walking uphill or upstairs. Achilles tendonitis can be caused by excessive stress or strain on the ankle over a long period of time. This can be through over-strenuous activity or overuse. Wearing high heels over a long period of time can also result in Achilles tendonitis, as this causes the calf muscle to contract more than normal, and effectively “shortens” the tendon. This results in excessive strain on the shortened tendon when the foot is flat on the ground. Achilles tendonitis can take a long time to heal, because the Achilles tendon has a poor blood supply compared to other areas of the body. If the condition is left untreated, it can develop into chronic Achilles tendonitis, which is a long-term, more severe case, and is more difficult to treat. Chronic Achilles tendonitis can develop into a rupture. What is the difference between a partial and a complete Achilles tendon rupture? A partial rupture of the Achilles tendon is a rupture or a tear which spans less than half of the width of the tendon. The tendon is therefore not completely ruptured, but it is still damaged. In a complete rupture, the tendon is completely split in two across its width. Complete ruptures can either be acute or chronic. Surgical treatment is generally recommended for complete ruptures, however conservative treatment may be used depending on the patient’s age and/or lifestyle. For elderly or less active patients, surgical treatment may be unnecessary, and conservative treatment may be used. What is the difference between acute and chronic ruptures of the Achilles tendon? A rupture is generally classified as acute if the injury is still recent. The tendon has ruptured completely, but the two ends of the tendon can be pulled back together to close the gap and reconstruct the tendon. This is because the injury is still fresh and scar tissue has not yet formed within the gap to prevent the ends from being brought back together. If an acute rupture is not diagnosed/operated on within a few weeks of the injury being sustained, the ends of the tendon begin to retract. This is due to the calf muscle contracting and essentially “pulling” the two severed ends of the ruptured tendon further apart. This, as well as scar tissue beginning to form in the gap between the two ends of the tendon, means that it is no longer possible to pull the ends back together. Therefore the tendon must be reconstructed using a different method. Achilles tendon ruptures can be divided into classifications, or “types”. These types determine whether the injury is partial or complete, whether the injury is acute or chronic, how severe the injury is, and whether surgery is recommended. For further information about each classification, please click the buttons above. Type I refers to partial ruptures. Conservative treatment (non-surgical) is generally used to treat partial ruptures, and may also be recommended for complete ruptures in elderly or less active patients. Typical conservative treatment for an Achilles tendon rupture includes immobilizing the ankle in a brace or plaster cast, which positions the foot so that it points downwards. This position is known as plantarflexion. In partial ruptures, this position places less stress on the tendon. In complete ruptures, this position places the two ends of the tendon in closer proximity, so as to heal better. The brace or cast will generally be followed by physiotherapy, and the patient may be given a heel lift, which maintains the optimum position for healing. Non-steroidal anti-inflammatory drugs (known as NSAIDs) may also be prescribed. Type II refers to complete acute ruptures, with a gap of less than 3 cm between the two severed ends of the Achilles tendon. Type II ruptures are typically treated surgically with a procedure called end to end anastomosis. This procedure involves rejoining the two ends of the tendon. Sutures (stitches) are often used, although these can sometimes cut through soft tissue. 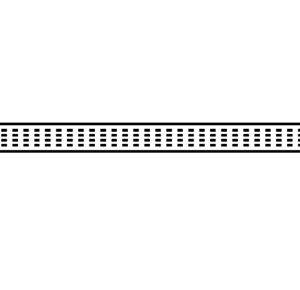 A synthetic implant such as the Neoligaments AchilloCordPLUS may also be used. 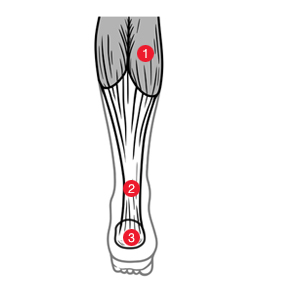 Type III refers to complete chronic ruptures, with a gap of 3-6 cm between the two severed ends of the Achilles tendon. Type III ruptures are often treated surgically with either a tendon graft or a synthetic graft. This surgical procedure involves “harvesting”, or extracting a tendon from another part of the patient’s body, and implanting it at the site of injury. The harvested tendon can span the gap between the two ends of the Achilles tendon. Disadvantages of tendon grafts can include weakness in the area from which the harvested tendon is extracted. This is known as “donor site morbidity”. Tendon grafts also tend to debilitate (lose strength) when they are harvested, as the tissue suffers necrosis (tissue death). Some strength is gradually regained after implantation, but this can mean a longer recovery period. Synthetic graft surgery is similar to tendon graft surgery, but instead of repairing the injury using one of the patient’s tendons, a synthetic implant (such as Neoligaments’ AchilloTape) is used. As with a tendon graft, the synthetic graft spans the gap between the two ends of the Achilles tendon. Unlike a tendon graft, there is no donor site morbidity or weakening of other areas of the body, and no tissue necrosis, which can mean a shorter recovery period. Type IV refers to complete chronic ruptures, with a gap greater than 6 cm between the two severed ends of the Achilles tendon. Type IV ruptures may be treated with a tendon graft or synthetic graft, as described above. A surgical procedure called gastrocnemius recession may also be an option. This procedure involves “releasing”, or clipping the gastrocnemius tendon in the calf, which decreases tension and effectively lengthens the calf muscle, bringing the two ends of the Achilles tendon closer together. Sometimes gastrocnemius recession is used in conjunction with a graft. Disadvantages of gastrocnemius recession may include weakness in the calf. The AchilloCordPLUS has been designed specifically for acute Achilles tendon repairs. It is 5 mm in diameter and 800 mm in length, and is made from polyethylene terephthalate (polyester), which has been in use for the reconstruction of ligaments and tendons for more than 25 years. Its dense, tubular structure allows it to pass easily through soft tissue, making it easy to pull the two ends of the Achilles tendon back together. The dense tubular structure of the AchilloCordPLUS is less likely to cut through soft tissue and jeopardize the repair than when using sutures (stitches) alone. No need to immobilize the leg in a cast postoperatively, which allows patients to start physiotherapy/rehabilitation sooner. A small vertical incision is made at the side of the Achilles tendon, next to the site of the injury. A bone tunnel is created in the heel bone (calcaneus) using a drill, and the AchilloCordPLUS is passed through this. The AchilloCordPLUS is then passed through the Achilles tendon in a figure of eight shape via a series of very small incisions (stab wounds) at either side of the tendon. The ends of the tendon are pulled together and the AchilloCordPLUS is secured in a knot at the site of the injury. The ends of the tendon are then sutured (stitched) together over the top of the knot, and the small incisions are closed using sutures. Below is a brief outline of the prescribed programme following surgery with the AchilloCordPLUS. If you would like to see the full rehabilitation programme, please click the link below. Active plantar flexion (pointing toes). Prevent dorsiflexion (bending the foot upwards). A heel raise of 2 cm is put in place. Resting with leg elevated (not in plantar flexion). Elbow crutches are used for partial weight bearing; the amount of weight on the injured leg is increased as tolerable, up to 40% body weight. Walking with elbow crutches; up to 50% body weight. Stitches are removed if wound healing is satisfactory. Walking with elbow crutches; up to 75% body weight. Begin passive dorsiflexion (bending the foot upwards). Walking with elbow crutches; up to 100% body weight. Mobilizing with one elbow crutch, in opposite arm to the operated leg. NOTE: Return to driving is allowed only when full weight bearing without suffering discomfort is achieved. The Neoligaments AchilloTape implant is indicated for the reconstruction of chronic Achilles tendon ruptures. It is also suitable for cases where previous surgery or conservative treatment of Achilles tendon ruptures have failed. The Poly-Tape is made from polyester. Its open weave structure acts as a scaffold and encourages tissue ingrowth, where new tissue grows into and around the gaps in the device, adding additional strength to the repair. The flat open weave structure of the AchilloTape is less likely to cut through soft tissue and jeopardize the repair than when using sutures (stitches) alone. The open weave structure of the AchilloTape bridges the gap between the two ends of the ruptured tendon, allowing tissue ingrowth and strengthening the repair. A small vertical incision is made next to the site of the injury, and a bone tunnel is created in the heel bone (calcaneus). The AchilloTape is passed through the bone tunnel and then up through the bottom (distal) stump of the ruptured tendon, where it crosses over. The AchilloTape bridges the gap between the two ends of the ruptured tendon, and is passed through the upper (proximal) stump of the tendon in a figure of eight shape via a series of very small incisions (stab wounds) at either side of the tendon. 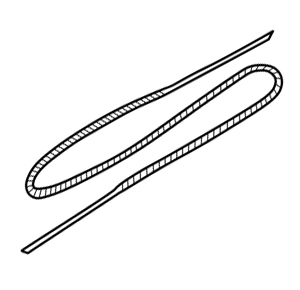 The two ends of the AchilloTape are tied with a reef knot at the site of the rupture to secure the repair, and the surplus ends of the AchilloTape are trimmed. The small incisions are closed using sutures (stitches) and a wool and crepe dressing is applied. Below is a brief outline of the prescribed programme following surgery with the AchilloTape. If you would like to see the full rehabilitation programme, please click the link below. Resting with leg elevated (not in plantarflexion). Concentrate on heel toe gait, and even rhythm. Increase ankle dorsiflexion (bending the foot upwards). Our procedures and products for reconstruction of Achilles tendon ruptures were developed in conjunction with Mr. G. Sefton of Harrogate District Hospital, and Mr. A. Jennings of University Hospital of North Durham, from the original technique of Professor Kyosuke Fujikawa of the National Defense College, Japan.